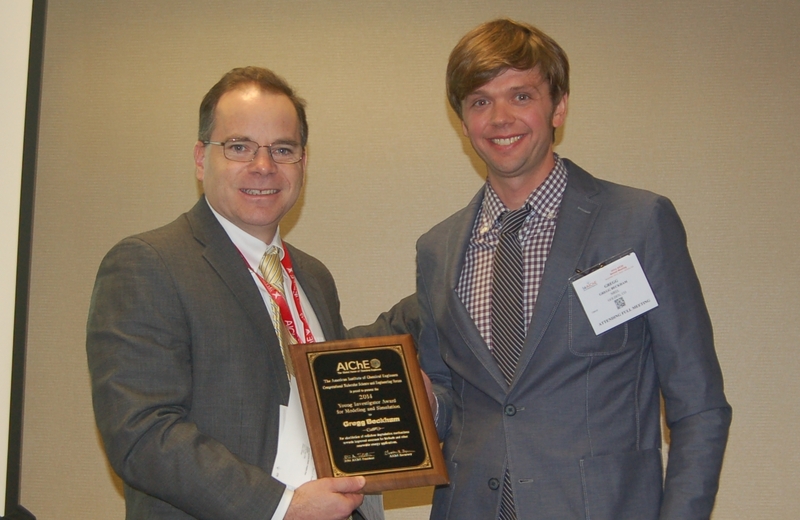 Joshua A. Anderson from the Department of Chemical Engineering at the University of Michigan is the 2015 winner of the CoMSEF Young Investigator Award. Joshua joined the Dept. of Chemical Engineering, University of Michigan, as a Senior Research Area Specialist in 2009, after obtaining his Ph.D. from the Department of Physics and Astronomy, Iowa State University and Ames Laboratory. 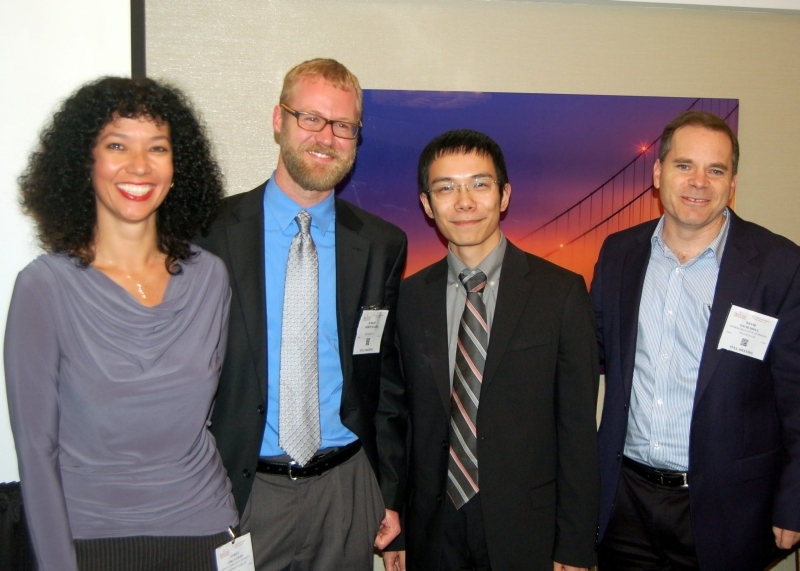 With this award, Joshua is cited “For contributions to the development and dissemination of open source, GPU-enabled molecular simulation software, HOOMD-blue, which enables scientific computations with unprecedented speed.” Joshua received his award during the CoMSEF Plenary Session at the 2015 AIChE Annual Meeting, where he also gave a talk describing his research. 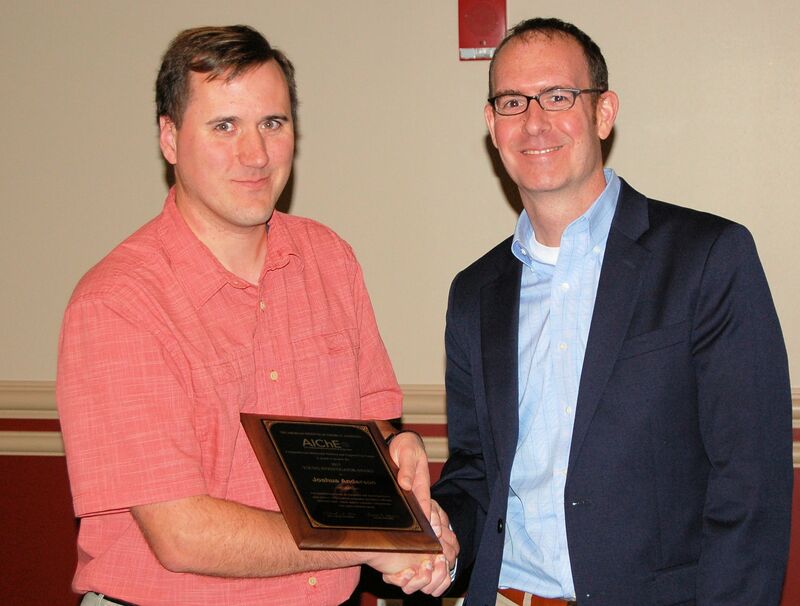 Dr. Anderson receives his award from CoMSEF Vice Chair Jeff Errington. Professor Cameron F. Abrams from Drexel University is the winner of the 2015 CoMSEF Impact Award, which cites his work “For the development and application of enhanced sampling and free-energy methods for elucidating thermodynamics and kinetics of protein conformational changes and ligand interactions,” Cameron has been on the faculty at Drexel University since 2002 after completing a postdoctoral appointment at Max-Planck-Institute for Polymer Research, Mainz, Germany, PhD at University of California, Berkeley and his Bachelor at North Carolina State University. 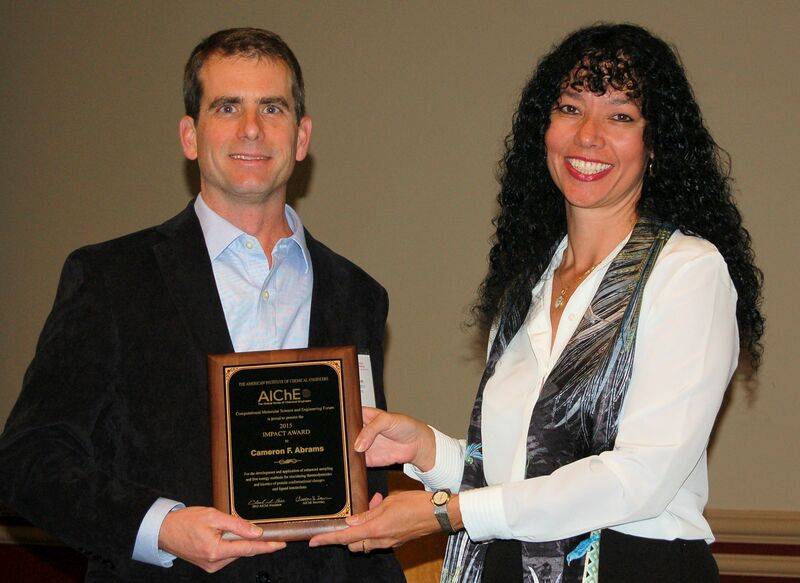 Cameron received his award during the CoMSEF Plenary Session at the 2015 AIChE Annual Meeting, where he also gave a talk describing his research. The CoMSEF Impact Award is given annually to a CoMSEF member who is within 15 years of completion of their highest degree. Congratulations to Vanessa Ortiz (Columbia) and Rachel Getman (Clemson) who were elected as CoMSEF Liaison Directors. Thanks to Karl Johnson and Lev Gelb who have completed their terms! Congratulations to Kayla Sprenger of the University of Washington (Advisor: Jim Pfaendtner) who won the 2015 CoMSEF Conference Presentation Award for her poster presentation "Obtaining Thermodynamic and Structural Information of Surface-Bound Biomolecules from Biased Simulations" at FOMMS 2015 (http://fomms.org). The CoMSEF Conference Presentation Award recognizes excellence in research by undergraduate students, graduate students and/or postdoctoral researchers. The intent of the award is to reward significant contributions to research in computational molecular science and engineering by young researchers. The award consists of an announcement for the presentation and a waived conference registration fee for the awardee. 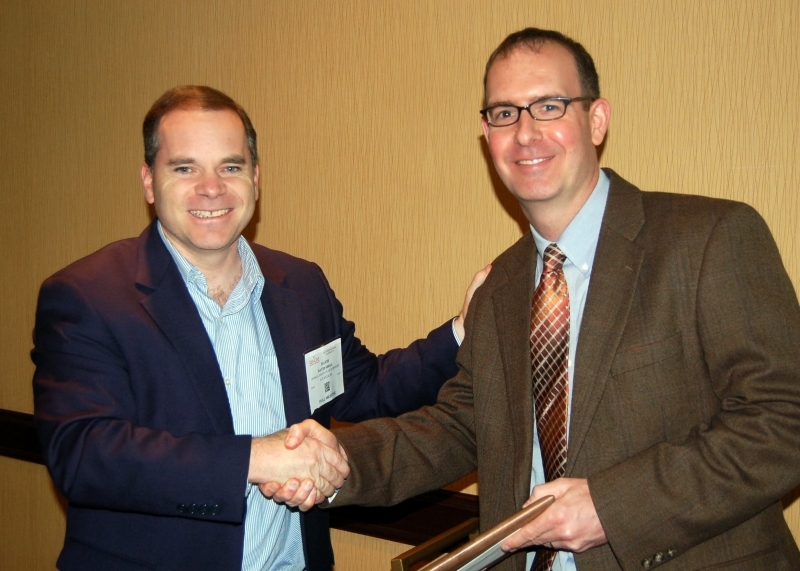 Dr. Gregg Beckham from the National Renewable Energy Laboratory's National Bioenergy Center is the winner of the 2014 CoMSEF Young Investigator Award. Gregg joined NREL in 20xx... With this award, Gregg is cited “...for elucidation of cellulose degradation mechanisms towards improved enzymes for biofuels and other renewable energy applications.” Gregg received his award during the CoMSEF Plenary Session at the 2014 AIChE Annual Meeting, where he also gave a talk titled “How the Walls Come Crumbling Down: Elucidating Mechanisms of Cellulose-Active Enzymes Using Molecular Simulation” describing his research. Professor Clare McCabe from the Vanderbilt University is the winner of the 2014 CoMSEF Impact Award, which cites her "...development of practical molecular equations of state for simulating thermophysical properties of fluids and novel coarse-grained simulation models for biomedical applications." 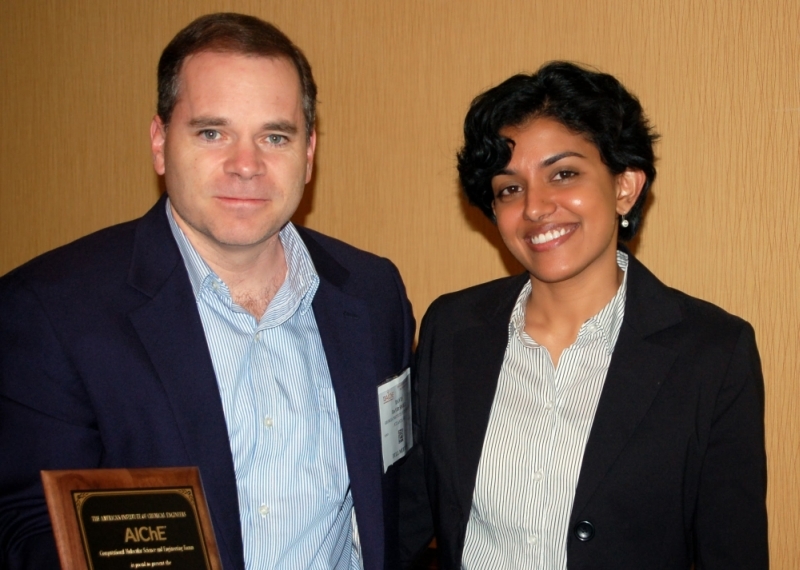 Clare received her award during the CoMSEF Plenary Session at the 2014 AIChE Annual Meeting, where she also gave a talk titled “Understanding the Self-Assembly of Skin Lipids” describing her research.